A Memorial Service for James Paul LeChevalier of Oakland, Arkansas, will be 11:00 AM, Saturday, February 28, 2015 at the Oakland Community Center followed by a luncheon. James passed away February 6, 2015, in Mountain Home, Arkansas at the age of 74. He was born November 7, 1940, in Calumet, Michigan, the son of Joseph and Margaret Driscoll LeChevalier. He married Gail Petersen in May of 2000, and worked as a Senior Buyer and National Executive for Sears. James lived in Oakland since 2000, moving from Barrington, Illinois. 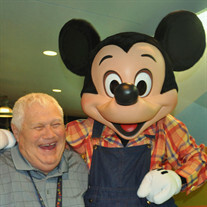 He was a member of the Twin Lakes Golf Club, on the Board of Directors of Gail's Pets Second Chance and a lifelong Disney fan. James is survived by his wife, Gail Ross of Oakland, AR; four daughters, Susan (Edward) Szekely of Edwardsville, IL, Laurie (John) LeChevalier-Litvin of Beaverton, OR, Linda (Dan) Wright of Brighton, IL and Jennifer (Edwin) LeChevalier of Edwardsville, IL; step-daughter, Teri (Michael) Ross-Klein of Chicago, IL; brother, Pat (Kay) LeChevalier of Elizabethtown, TN; six grandchildren, Kate, Jim, Jacob, Eve, Zach and Noah and the mother of his four daughters, Joanne LeChevalier. Memorials may be made to Gail's Pets Second Chance, P.O. Box 83, Oakland, AR 72661, Illinois Center for Autism, 548 S. Ruby Lane, Fairview Heights, IL 62208 or Twin Lakes Golf Course. Arrangements are by Kirby and Family Funeral and Cremation Services. To send flowers or a memorial gift to the family of James Paul LeChevalier please visit our Sympathy Store.